After escaping from a secretive cult, Devon finds herself walking along a back road with her young daughter. When Rawley sees her on the side of the road he knows she is running and offers her a lift and a safe place to stay until she can decide where to go next. Recently widowed, Spencer is still in mourning over the death of his wife. Thunder Point is a chance for a new beginning as the coach of the local high school football team. So when Rawley helps Devon to find a job and start building a life in Thunder Point he immediately pushes thoughts of the beautiful blonde from his mind. But as the weeks pass he finds himself drawn to her and they take some tentative steps towards a relationship. But both have baggage. Both have children. And Devon has a controlling and manipulative cult leader on her trail. 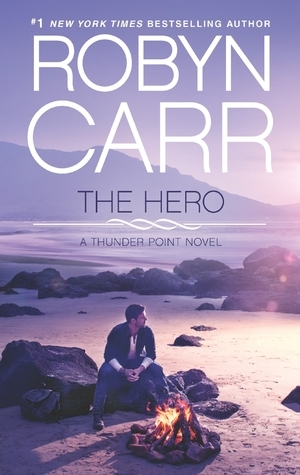 The Hero is what readers expect from Robyn Carr. It is a well written contemporary romance which is about more than just Devon and Spencer. Stories from previous books are revisited and characters are introduced who will appear in future books. The Hero reminded me a little of Shelter Mountain (Virgin River Book 2). That’s not a bad thing, Shelter Mountain is probably my favorite in the Virgin River series and I enjoyed this book almost as much. This entry was posted in Uncategorized and tagged contemporary romance, Robyn Carr, the hero, the newcomer, the wanderer, thunder point, virgin river by setaian. Bookmark the permalink.